What a pleasure to sit after today’s Zentangle Basics class and actually tangle the image that came to me during the class. 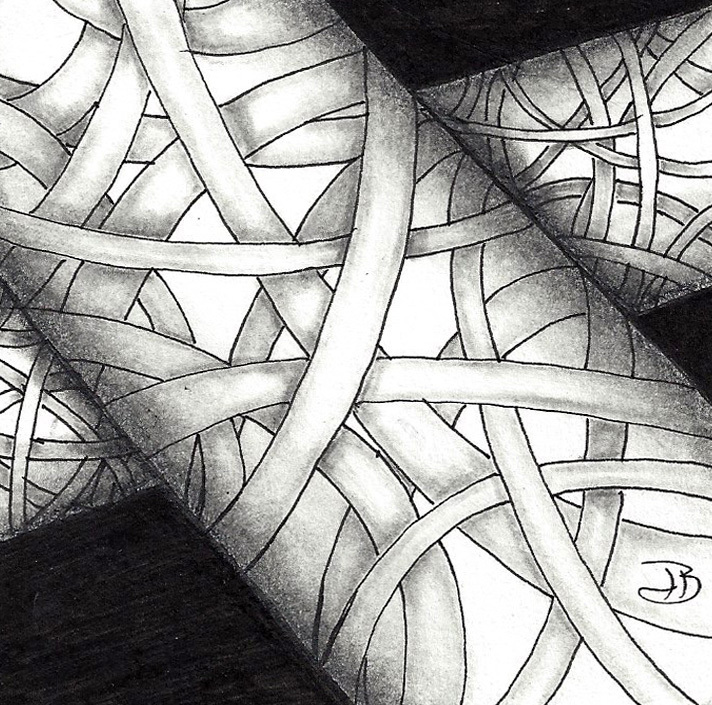 It was relaxing, inspiring and just plain fun – exactly what I look for when I turn to Zentangle. What do you think? Hollibaugh within Hollibaugh. Clever idea and very well executed. Nice work all round. Love the way you present your Hollibaugh! There is some great shading in it too. Deborah, I love your Hollibaugh. What a fun one to do. I love the 3-D effect. After my first class with you, I purchased a Zentangle kit for each of my grand daughters. But for my precious 11 year old grand daughter Ella Bella, Zentangle became an exceptional gift. It became the communication link between us. It became a tool of peace and calm for Ella. Within the past few months, Ella’s body has become a raging body of hormones gone wild complete with sever acne causing super sensitivity to words or looks, unexpected menses in the body of a little girl, creating an emotional uproar of disbelief and how dare you? To look at me, I am a woman ! Thank you for introducing me to this art. It has touched that place within for my sweet Ella Bella that is perfect, whole and complete, it made the difference itouching her authentic creative self ..her safe space. IMy experience of my first class in Zentangle art with you became the tool which allowed me to communicate and connect with, my 11 year old grand daughter .this Christmas . I had gone to the Grotto in Portland walking a labrynth and found my prayer focus was about creating a break through in communication with my precious Ella Bella. Ella had not gone with us to the grotto. I no longer had come back to the house and taken off the layers of clothing then Ella came to me asking if I would allow her to do eye make up on me?!! One of her aunties had sent aa large sampling of eye makeup. Of course I said yes but she would have to allow me to braid her hair! She agreed! Step number one! My daughter and her husband’s sister and her boyfriend were off to a Christmas party later that night. I stayed behind with the children. It seemed natural to ask my grand daughter if she would like me to teach her how to do the Zentangle art I had given her for Christmas? She agreed! I did this the way you taught, Deb. I explained how to do the small design. I taught her the basic shading. I had her start with the pencil dots and do the outline of the boarder. We then selected 4 small designs but we chose the same designs. Once done we compared. She was amazed at how different both of our designs were. 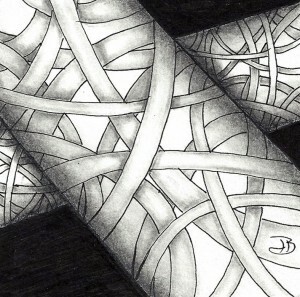 This was the miracle offered by Zentangle! Thank you!